Besides working on projects for great clients we frequently get involved in projects just to learn about new hardware, software, development tools, or online services. The experience is always valuable and sometimes the result is software that we can distribute publicly, or a website that we decide to keep online. A few of our client's projects and other experimental exercises are listed below along with case studies you might find interesting. We hope you enjoy the software. With 400 recycling centers around California, rePlanet, Inc. is the state's largest processor of consumer beverage containers. Management is keenly focused on customer service and wanted a standardized method to measure and report the customer's experience. Paper forms were standardized, but time consuming to collect from around the state, and entering the data into spreadsheets wasted more time and introduced errors. E-mail made the data collection easier, but standardizing the input was difficult. Our solution was to distribute iPads to the marketing team responsible for the retail centers. The iPads contained a "customer experience form" made up of about 15 questions. The questions covered both quantitative results (what were the weight and payment numbers on the receipt, and were they accurate?) and subjective issues (was the recycling specialist friendly, was the site clean?). Data from the iPad is immediately sent to a server where the results are collected into near-real-time reports on a management website. Every one of their 400 centers are now visited quarterly and the resulting current and historical reporting takes no time to generate. Another interesting result of having such timely data is that we have developed several metrics that indicate serious problems. These triggers generate automated text messages and/or phone calls to a local supervisor or loss prevention specialist who can be on-scene quickly. Federal Innovation is a maintenance company serving about 250 retail stores across four states. Their employees are primarily carpenters and painters who work out of a truck and rarely visit the office - not the kind of people who typically have a computer or smart phone. The challenge was two-fold: 1) getting up-to-the-minute information about customers, service calls and spare parts inventory to the workers; and, 2) helping the people in the field submit work orders containing the billing record for hours worked, parts used and supplies purchased. Traditional laptop computers were ruled out because of dirt and dust, and the generally rough working conditions, and the worker's dislike of the keyboards. However iPads, covered in protective cases, have thrived in that environment. After getting over some initial reluctance, the workers needed only a little training and practice before feeling comfortable. 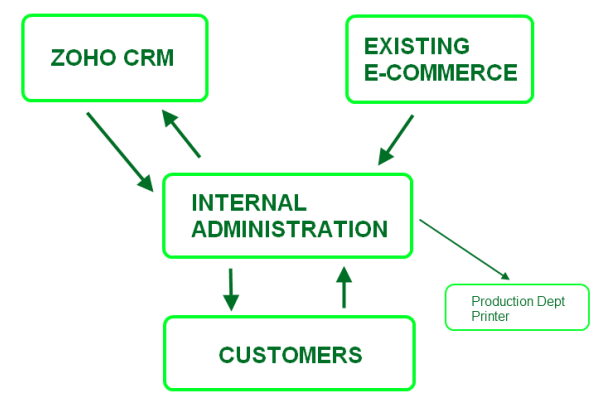 This PDF file describes a recent project were we integrated a third-party e-commerce Web site with Zoho CRM, and a new customer site for invoice payment. The result was improved cash flow, faster time for getting new orders into production, easier access to customer information for the telemarketing team, and most important, happy customers because they can easily see their order history and pay bills without the hassle of checks. After completing the Get Starbucks app for the Palm Pre we realized that there isn't a comprehensive and accurate directory of coffee shops. This is obviously a big problem so we designed our own community-maintained directory. 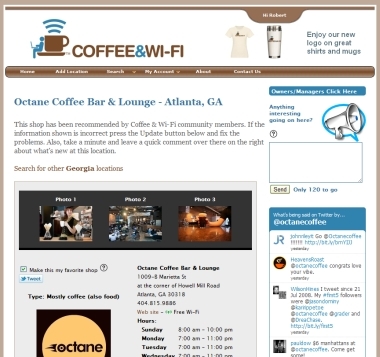 Anyone can add coffee shops or update the information about existing shops. When you visit the site you'll notice lots of interesting animation, sliding panels, photo gallery upload widgets, and other user interface elements. We are using this site to test new code to see if users find it easier to use. When Palm/Sprint introduced the Pre to compete with Apple's iPhone, the reviews were great. So we downloaded the software development kit, bought a Pre and got to work. 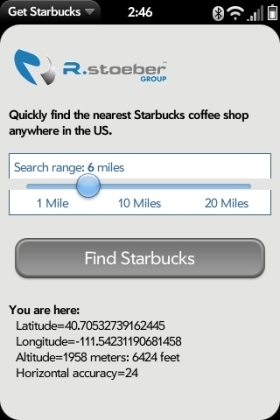 The resulting app takes advantage of the built-in GPS to pinpoint your current location, and then displays the nearest Starbucks locations on a Google map. We were honored to be one of the first apps to be distributed through the unofficial "Homebrew App Store" at PreCentral. At last count it's been downloaded about 9,600 times, even though it's hard for the average Pre owner to track down. Google Voice is a phone call management system that has been adopted by millions of users. After signing up for the free Google Voice service you will get a new phone number that can ring multiple phones at once, letting you answer where it's most convenient. Record custom voicemail greetings for individual callers, or groups. 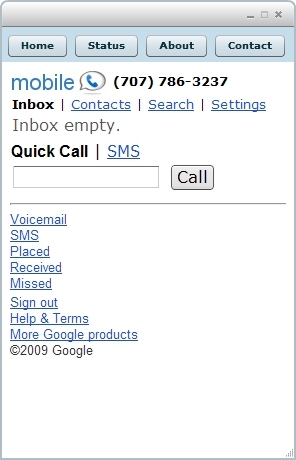 Send certain callers directly to voicemail, while others ring on your phone(s). The Google Voice transcription service will also send you an e-mail, allowing you to read voicemail messages at your convenience. Visit the Google Voice website to sign up. Our desktop application makes it very easy to keep Google Voice available at all times. This makes it much easier to use for quick text messages and the added convenience means you'll use it more often.